To rank highly in the search engines and succeed at inbound marketing you need to create content. Written content is the easiest and least expensive content to create. You don’t need to invest in graphics or video software. Writing, however, can be a daunting task! If you have not trained to write professionally, then you might wonder if it’s good enough for the world to read. Even if you have been trained to write self-doubt can create issues. Perhaps you are blocked by a fear of criticism. The content you write needs to be not only grammatically correct, but also engaging and relevant to your audience. To check for spelling and grammar, you can run your copy through your word processor’s spell and grammar check. Evaluating relevance and engagement is more difficult. Yes, you could have several people read your content. However, their opinions may be subjective. Or you might work alone and not have the luxury of having others proof and read your content. I, too, suffer from content writing insecurity. In my quest to improve I’ve come across two cool tools that help me and which I hope will help you. 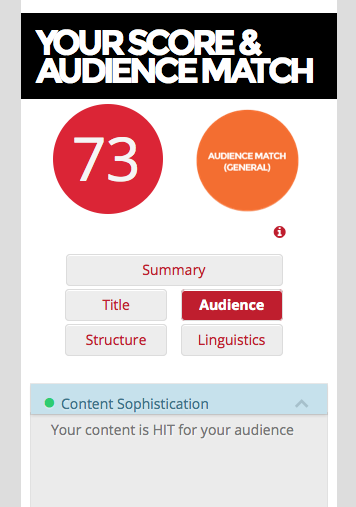 Atomic Engager scores the engagement of your content and offers tips for improvement. Atomic Engager Lite is free. There are also paid options. My first attempt at writing this blog post garnered a score of 54%. Not bad. However, the APP tells me I need to go for a score of at least 60% for optimal audience engagement. The APP also gives tips and suggestions for improvement. Using some of the writing tips and suggestions, and after several revisions, my next score improved. The score was 73%. The next APP to try is Customer Focus Calculator. You must know that customers have pain points and problems to be solved. Your job is to write content that will satisfy those needs. But how do you know if the content you write is doing its job? Enter Customer Focus Calculator. You simply enter your URL and company name. The APP will then calculate the customer focus of your content. 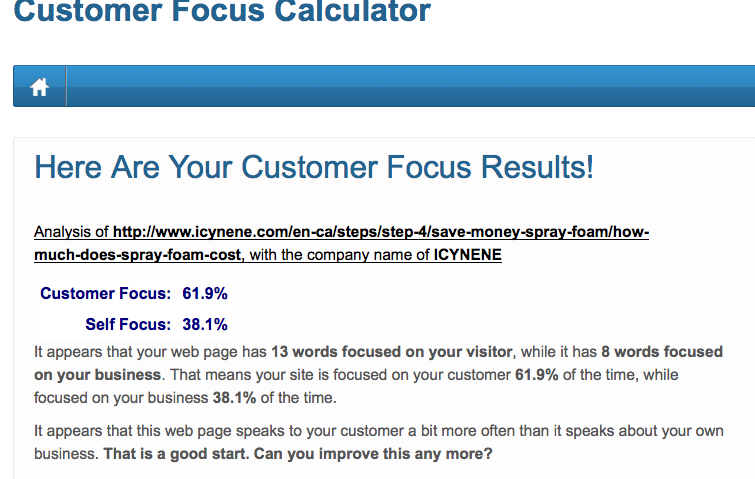 I entered the URL of a web page I wrote and found that the customer focus was 61.9% on the customer and 38.1% self focus. Whew. Glad to know this page is more about our customers than about us. So you see, there’s no need to agonize any more about the quality of your content. Give these APPs a try. Let me know if they help you by leaving a comment.